Inherited Faith Is Dying. Chosen Faith Is Not. You may say, “I know the gospel,” but since the gospel is endlessly rich and infinitely multifaceted, there’s always something new to learn about its power and effect (1 Pet. 1:12). 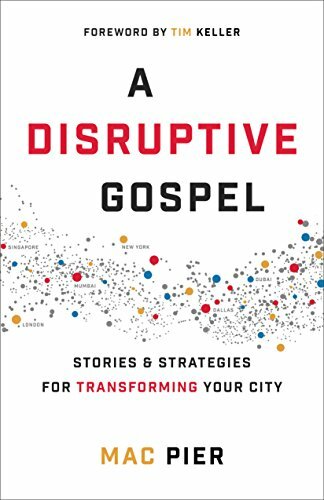 In the pages of A Disruptive Gospel: Stories and Strategies for Transforming Your City, Mac Pier shows how the gospel has the power to disrupt the status quo, which is indifferent to evil. The gospel disrupted the life of a complacent teenager in South Dakota. It disrupted a cold, hard resistance to historic truth in the boroughs of New York City and the center of Manhattan. It disrupted the high walls between denominations and the even higher walls between the races and classes to form an unprecedented unity and movement to reach the metro region of New York. And it has begun to make use of the new and close connections between the great global cities of the world to spread many of these same influences and effects to other urban centers. This is the story of all that, and—if you’re a Christian minister or lay leader—you could hardly find a more encouraging book to read today. I can imagine skepticism regarding the claims about what God is doing and will do in cities. Don’t all the headlines tell us that Christianity, and even belief in God in general, is in retreat, especially among the young millennial generation and in the centers of Western secular culture—the great cities? Aren’t the cities of Europe, for example, filled with empty church buildings that are being turned into nightclubs, restaurants, and condos? Isn’t religion in a downward arc of inevitable decline? No. Last year those of us at a European church planters’ conference in Paris were addressed by Grace Davie, emeritus professor of sociology at the University of Exeter in Great Britain. She pointed out that, yes, nominal or inherited Christianity is declining. By this she meant religion people are born into, so that one might say, for example, “I’m Norwegian, so I’m Lutheran” or “I’m French, so I’m Catholic.” We live in modern societies where we’re taught the importance of our own free choices. Inherited religion no longer maintains its hold on most people. This is why, overall, fewer people born into a church-connected family end up attending and belonging to those congregations. However, she noted (against all expectations) that new movements of Christian faith are growing in Western cities. One reason for this is the influx of Christians from the Global South. In China, Africa, and many other places in the world, Christianity is growing rapidly as those societies are modernizing. Then, as people come to Europe and the United States from Africa, Latin America, and Asia, they plant new churches or strengthen other ones that are growing and reaching those cities. Why? Because, while religion that’s inherited will decline in the modern age, religion that’s chosen will not. The growing Christian churches are evangelical and Pentecostal, and they emphasize the biblical call to “choose for yourselves this day whom you will serve” (Josh. 24:15) and the biblical teaching that we stand or fall on our own faith, not the choices of our family or community (Ezek. 18). These churches teach that vicarious, formal religion isn’t enough; there must be a radical, inward conversion (Deut. 30:6; Jer. 9:25; Rom. 2:29). Christianity that foregrounds these important biblical concepts and lifts up heart-changing personal faith can reach many contemporary people—and it can reach cities. Davie, a sociologist, observed that much of the new Christian movement and growth is coming into various nations through their greatest cities. New spiritual vitality is coming to Europe and parts of the United States that way, and Christianity is also coming to non-Christian countries through their chief urban areas. While cities, she says, have in the past been seen as “beacons of a more irreligious future,” now in the cities Christianity is thriving since they’re more multiethnic and more globalized, and the new kinds of faith that call modern people to decide and choose are being deployed there. Davie added, as an example, that London now has more growing churches than anywhere else in Great Britain. This message is both exciting and challenging for Christians in cities today. In Western countries, many of the older churches relying on inherited faith are dying. Gone is that great “canopy” of nominal Christians who weren’t personally devout but who thought religion was good and important and who weren’t difficult to draw into Christian churches. Contemporary people, however, have plenty of the same intuitions of God and sin and spiritual longings for love, meaning, and grace that their ancestors did. Some will hear the same message and say, “You are out of your mind!” (Acts 26:24), while others will be cut to the heart and ask, “What shall we do?” (Acts 2:37). 1. The gospel matters. There’s the power. Know, believe, and lift up the gospel, and everything will change. 2. Church unity matters. Denominations and traditions complement and supplement one another. No one church or kind of church alone can reach the city. 3. Cities matter. The people of the world are moving into cities faster than the church is. No mission is more imperative than multiplying churches and ministry in urban areas. 4. Millennial leadership matters. These great challenges will not be met unless the reins of leadership are passed to this generation now. 5. Movement matters. What’s a movement? It’s actually not easy to define. But if by faithful ministry you release the power of the gospel and bring the churches and generations together in prayer and ingenuity to reach your city—well, you’ll know a movement when you see it. Editors’ note: This excerpt is adapted from Mac Pier’s book, A Disruptive Gospel: Stories and Strategies for Transforming Your City (Baker, 2016). Used by permission.